I had a lot of fun on my 5th day in Tucson! I started out the day shopping with Toyo of Feng's Trading and a bunch of his special, new stock had just arrived! I actually did quite a bit of shopping the night before since we arrived at his show after closing time so I could help him close up and then we followed him to Sachiko restaurant for dinner. He was still unpacking boxes that morning so I did a bit more shopping. Here are the strands I picked up. And a picture of Toyo and I and his loooonnnngggg table of beds. That's my mom way down at the end! Toyo's beads ... see my mom way down at the end? Once I finished up with Toyo we headed over to the Kino show (formerly TEP). I found another one of my favorite bead vendors - Royal Quality gems. Here the 2 owners are with my mom and some of the beads I got there. Then we had some lunch and headed over to JOGS to close out the day. I got some sterling silver from SII (the least expensiver per gram that I've seen). Here's a picture to let you envision the way things look when we're wandering the halls. Gemstones (precious and semi-precious) by the trayful! I'm tired so this is it for tonight. We head home tomorrow but I still have several other days to share with you so you'll get more updates even after I'm home! Our Monday morning adventures continued as we met up with Bob of Really Old Rocks and his friend Gary Johnson. I got some turquoise (of unknown origin - old from the estate of a bead shop owner) and apache tears from Gary. Here's Gary and the pretties I got from him. I always have fun checking out Bob's things because he has different rocks every year. This year he had a lot of Yellowstone Ash Agates. He had these tested and they are 630,000 year old amygdules most likely from the Lava Creek explosion. They're pretty cool looking and a bit different. I got some banded iron (aka genesis stone) and some ash agates and my mom got a piece of dinosaur bone! Here's Bob and his rocks! After we finished up at the Miner's Co-op show we did a quick stop at JGM so I could put aside some amber chips for a friend of mine and then we headed back to the Pueblo Show to get some half drilled drops at Yau Shing Gems. On our way in I took pictures of some of the cool and BIG minerals and gemstones you'll see at all the hotels along the freeway. I have no idea what either of these is - but they look cool!. It took a while to sort through the various packs of half drilled drops to make sure I can match up pairs and here is the pile I ended up with and a picture of the two people who helped me - brother and sister! As we were leaving the Pueblo show I saw one of my gemmie friends, Robyn Hawk and not far behind was another friend! What a coincidence! Here's a picture of us gals with one of the many crystal skulls you'll see at the freeway shows. Our next stop was the 22nd Street show. I was in search of an ammolite pendant for a friend of mine. As I looked and looked for what I thought I saw 2 days ago I found a man, DavidOtteson, selling ribbon turquoise cabs. I can't believe I missed him 2 days ago since I love ribbon turquoise! It's hard to find since it has to be just a thin ribbon of turquoise in some hard rock like quartz or jasper. I did forget to take a picture of David, but here are the gorgeous cabs I got. Aren't they purty! Then I did a final check for the ammolite pendant and found it in a booth I didn't even look in before. I have no idea what I remembered seeing on Saturday. Well it took a bit of back/forth messaging on facebook, sending pictures of various pendants, waiting for an answer, ... but in the end here is the pendant she'll be getting and the fun folks at Morning Sun Jewelry from Grass Valley, California! I just keep running into Californians all over the place. The next stop was dinner with Toyo Feng of Feng's Trading. I've been buying for him for as long as he's been selling on his own - amazing! This is the first time our schedules meshed so we could have dinner together. Here we are at Sachiko's enjoying sushi, sashi, tempura and teriyaki beef. Now I'm 2 days behind in posting - but Mr. Sandman is telling me it's bedtime - so good night for now! My mom and I started off the day at the Miners Co-op Rock Show We went there looking for Bob of Really Old Rocks. However as we started wandering through the show my eye was drawn to the cool cabs that Wayne Holland of Dirt Diver Exploration had on his tables. He cuts them himself. He has access to Ghost Jade, Nevada Rose Dumortierite and LOTS of copper in various stones. Here's a picture of Wayne and the cabs I bought. We continued our wander and next saw some cool stones at Agate West. David Furcean is the owner and cutter and tumbler. I wanted to get more stones for my sandwich jewelry (as I call it) so I dug through his bins and picked out some pretty ones in blue chalcedony and blue aztec agate.... Here is David and some of the pretties we got. Amethyst geode - so cool and purple! Then we found a great pizza place for lunch - Grimaldi's. We just had salad and the luscious oreo cheesecake - but the pizza is thin crust and looked yummy! Of course I forgot to take a picture of our fun waitress! Next we went back to Gem Mall. My first mission was to find some sterling at a decent price. I did find some at a much better price than I saw yesterday in the other gem mall building. So I got sterling stuff, then checked out the Czech glass bead colors at Starman and then just started wandering the floor ... I was really tempted by some African beads - thin glass rings about 10mm, some old trade beads (supposedly quite old - I just liked the pinch shape and lovely pastel color) and several types of bone beads. But the rings are a HUGE strand and it is pretty price and only one color per strand. I can envision uses for thin glass rings, but not for as many as there are on probably a 3' strand (they are 2-3mm in width - you do the math!)... Ah well - I'll let my designer brain think over what I saw to decide if I should go back and see what kind of price I can negotiate for. Another booth did have beautiful, opaque turquoise glass rings ..... for the same price ... but I just don't know what I would do with so many! Further wandering brought me to another booth with inlaid conch shell beads and inlay bone beads. I remember seeing those last year - or something similar and I was tempted but didn't bite. This year I did get some of those since they just looked cool. Once again I forgot to take pictures! Hopefully I'll be back at gem mall - but I got behind on things today because I found some new wonderful vendors! Here are the cool beads I got. And mother nature gave us a treat as we left with this absolutely gorgeous sunset. Sunset at gem mall - absolutely stunning! 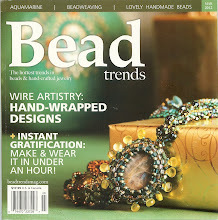 I was just too tired last night after catching up on all the business related emails to take bead pictures and share them all with you. I totally forgot to take any venue pictures! Even today I only took pictures at the new venue (for us) that we visited - but I did get some good ones there. Yesterday I started out at the JGM - Simpson St. show on its first day to make sure I got first crack at the beads that Toyo Feng of Feng's Trading brought to the show. He always has wonderful quality, he knows exactly what/how it's made, if the stone has been treated and he often has some cool cuts! I found him 4 years ago and he is one of a few dealers that I have to visit on the first day of the show. Oh he had some beautiful stuff! Kingman and Sleeping Beauty turquoise, some gorgeous carved ovals of mosaic creek jasper, beautiful carved citrine leaves .... ah I could go on and on - but I'll let the pictures show the story since I forgot to take a picture with Toyo! Hotel room pictures are never the best - but hopefully you'll get a feel for how beautiful the stones are. As you can imagine I spent a lot of time looking through beads! Angelite and the cutest little, flat pyrite squares I've ever seen! Aren't these just the coolest carved barrels in red creek jasper? Petrified wood beads - wow! After lunch my mom and I had to get something cleared up with the rental car company (I was on empty after only 1 day of driving and they marked full on my contract - oops!) and then we hit Gem Mall. We went to the 1000 building to start and I didn't see too much that got my creative juices flowing. I did have to go to Nirvana beads because they were selling the "cultured sea glass" beads for Znet shows and I love to use that in designs. Unfortunately that was not a pleasant experience. Our salesman, Nir (who, it turned out after some googling late last night, is the company PRESIDENT!!!) spent almost my entire visit at his booth complaining about Chinese vendors, Chinese products, ... Why he agreed to sell fake sea glass for a Chinese company in his booth is beyond my comprehension since he was quite negative about the glass, showed total disdain to those wanting to buy it and, even more amazing to me, made no attempt to show the buyers how they could pair the sea glass with his beautiful Czech beads. I had to go digging through piles and boxes myself (since he didn't even know what products he brought to the show) to try to find some matching fire polished rounds for the sea glass I picked out. I only found 2 colors that matched. I have to wonder why he didn't make sure, before he packed for the show, that he had Czech beads that complemented the sea glass. That seemed like a real easy way to improve sales to me. But it does require some planning ahead of time and you do need to actually talk to the customer about what they want so you can offer them some complementary beads in your own product line. Anyway - I spent very little since he did not have many of the sea glass styles I like, had very few Czech beads to match and I really wanted to minimize my time around him. I only caught his first name while I was there but my mom was sure that this Nir was the Nir in Nirvana beads. It turns out she was right! Once I found out who he was I sent a scathing email to the company contact email because I just couldn't believe any company president could act that way. I've had vendors totally ignore me, in which case I leave, and some don't really warm up until they see that you're serious about buying - but I have never heard the amount of negativity that I heard from Negative Nir. Oh - and I had to bag everything up myself! He just handed me his cell phone to sign for the credit card purchase and walked away! Nir did respond this morning and apologized. He said he would take my comments to heart. I don't know that I'll actually go visit him again to find out because I have had so many pleasant dealings with Starman (Czechbeads.com). They have a very professional display at the shows (bundles of beads are not just piled wily-nily on tables) and their sales staff is helpful, positive and friendly. Anyway - I don't want to end this post with that negative interaction so here are the pretty beads that I was able to get at Nirvana. Won't those Czech rounds look just gorgeous in a cascade above the glass drops?